Many thanks to LENE JENSON of Norway, for selling Bucky to us in 2008. 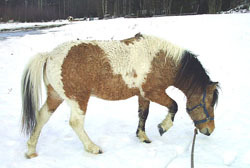 107cm registered curly Buckskin Stallion with Tobiano markings. A wonderful little pony, with a hypoallergenic coat, great personality and powerful movement for such a small guy! 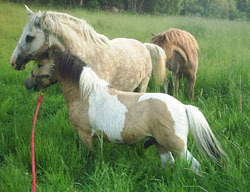 ‘Bucky’ can be bred to larger mares as well as pony’s his size to produce great ponies for children to ride and adults to drive. 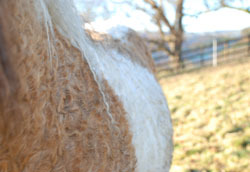 Bred to a normal coated mare, you have a greater than 50% chance of a hypoallergenic curly coat as the curly gene is dominant. All our foals to date from Bucky are curly, even those to our non curly mares. He is an awesome breeding stallion. Easy to handle, easy to breed and he knows his job. Curly or not, Bucky is a fantastic pony stallion. £85/€100 per dose/insemination (6-8 straws). Vets recommend 3 doses. Contact us for shipping costs and more information. We are offering Bucky for sale as we will not be increasing our pony stock, but concentrating on our horse breeding programme.